The temple of the Dancing Shiva in Chidambaram is an ancient tirtha of great spiritual power and wonder. Among the many wonders is one that is both exceptional in its spiritual as well as its scientific value. That is the Golden Roof of the Chit Sabha. The Nataraja, Dancing Shiva, is the presiding deity here. He dances his Cosmic Dance, not in a garbhagriha, as the holiest shrine in a Hindu temple is called. But in the Hall of Wisdom, the Chit Sabha. The Chit Sabha is build from wood, and it has a very special roof. This roof is made completely from gold. In very ancient times it gilded by the early Chola kings. Nobody really knows when it was first given this golden roof. 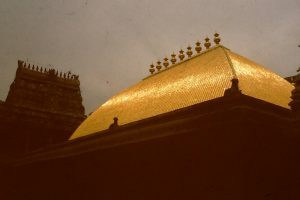 What we know for sure from the historical record is that the first kings that claim in writing to have gilded the roof of the Chit Sabha in Chidambaram are Aditya Chola I (c.870 – c.907 CE) and his son Parantaka Chola (907–950). Both Aditya and his son Parantaka Chola were valiant kings who expanded their small land. Originally submissive to both Pallavas and Pandyas they first won independence. And next expanded towards the north, the south, and also along the Caveru river towards the west. From their conquest they brought home the gold and used this to gild the roof of the Chit Sabha, where Nataraja dances the Ananda Tandava. The shape of this roof is unique. It is not square and it is not a pyramid, as we find with other temples. It slopes with a special tilt, ending with a slight upward curve. It is made of 21600 golden platelets, each inscribed with the Panchakshara, the sacred sound formula dedicated to Shiva. The “Om Nama Shivaya”. They are positioned one over the other in the way of a traditional slate or wooden church roof, or fish-scales. And held together with 72000 golden nails. The platelets are symbolic of the breath or asu of a human being. According to yoga we make 21600 breaths in a day. The power of the breath, the prana is spread through the human body through 72000 nadi or veins. Often the question is asked what the value or the weight of the Golden Roof is. But the real value is not in what it represents in monetary or material worth. Its real value, which is priceless, is the secret and hidden meaning that it conveys.